Don’t waste your precious time in Shanghai searching around suburban metro stations for the right bus. Experience the charming water town of Zhujiajiao the easy way on a door-to-door half-day tour with private guide. 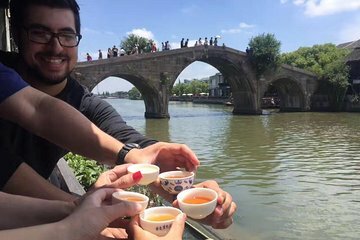 Ride a gondola down ancient canals and under reflecting bridges; sample local delicacies from dumplings to candy; and admire 16th-century Fangsheng Bridge. Upgrade to add a trip to one of China’s celebrated acrobatics shows. Portia was amazing. Her depth of knowledge was impressive. In a real sense she tailored the trip to our needs. Her advice and guidance was also indispensable. If I were to return to Shanghai, I would request a tour with Jenny's Shanghai tours and specifically with Portia. We took this tour after a long tour through China. We saw many wonderful things. this was a highlight.